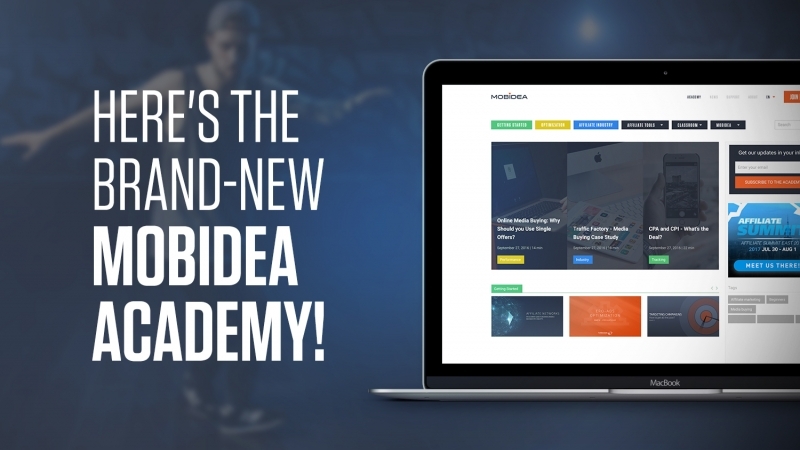 Home > Affiliate Marketing > The Brand-New Mobidea Academy is now Live! The Brand-New Mobidea Academy is now Live! Mobidea is one of the most innovative affiliate networks around, having proved its status as a trailblazer some months ago, upon releasing an amazing new platform with Tracker Capabilities. Now, the mobile affiliate network is at it again. Proving that its bet on education continues to be a remarkable investment, Mobidea has announced that a new Mobidea Academy has now been released. Users can now explore one of the most popular educational platforms in the industry. From now on, users can discover a whole new platform which has a responsive and colorful design, as well as a number of fantastic surprises for both newbies and more experienced marketers. This brand-new Mobidea Academy can boast about a video section. This is where affiliates from all over the world can watch videos in which important aspects of the affiliate network are explained. These “Learn the Platform” videos are basically guides for affiliates to watch. The company can also brag about the creation of Learning Paths which are basically sets of articles. Each article set – Learning Path – has a particular level of difficulty. This will effectively allow affiliates to actually be educated by the network, starting from posts created for beginners until they reach much more complex articles. This is quite the tool, as it clearly ensures affiliates get an education that’s well structured. The Affiliate Guides are also a new addition to the Mobidea Academy. Users will have the chance of inserting their email and of getting a free guide focused on affiliate marketing, native advertising, media buying, etc. The Affiliate Glossary is another absolutely unprecedented page which will certainly help affiliates understand all the information the industry has to offer. The new Mobidea Academy is a tremendous educational investment. One that Mobidea is more than happy to make. Now, the time has come for you to actually check this new platform! Experience a new Mobidea Academy!